Rachel was a typical 16 year old and a junior at Normal Community High School (NCHS) in the fall of 2007 when she complained about a spot on the back of her thigh that didn’t feel right when she sat. After ruling out several other possibilities, she was diagnosed with a rare form of cancer, soft tissue sarcoma, and a tumor the size of a baseball was removed from her leg. She recovered from the surgery, had 6 weeks of radiation, and returned to being a normal teenager (with a large scar on her leg!). Sadly, the cancer returned to her lungs in the fall of 2008, and she lost her battle on January 18, 2009. She was an amazing young lady who never complained about her struggles, and she has inspired a huge number of people who knew her or heard her story. 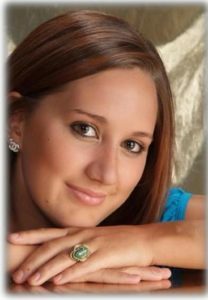 The Rachel Vincent Memorial Fund has been established to make both an annual scholarship award to a Normal Community High School senior and to make a contribution to the Sarcoma Foundation of America (SFA). The annual donation to SFA will also start out at $1,000, made in memory of Rachel. This donation will be used to assist in medical research efforts toward finding a cure for sarcoma. If you would like to make an online donation to the Rachel Vincent Memorial Fund, please click on the button below. If you prefer to make a donation in another manner, click here for information.